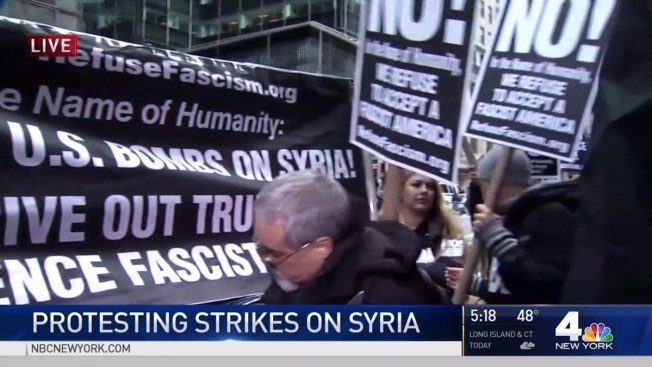 Hundreds of protesters took to the streets of Midtown to demonstrate against the airstrike in Syria ordered by President Donald Trump. Dozens of people began to gather along Fifth Avenue at around 5 p.m. Friday, many with signs denouncing the Thursday night bombing. A separate group of dissenters planned to gather near Columbus Circle to protest the presidential action. Armed with yellow signs that read "Bombing Syria doesn't protect people, it KILLS THEM," demonstrators marched near East 56th Street to decry the strikes against the Middle Eastern country. Many Syrians in the tri-state are keeping a close eye on what's happening in their homeland following U.S. airstrikes on a military base there. Melissa Russo reports. Others carried signs that said "NO! In the name of humanity, we refused to accept a fascist America." Amid the different signs was a unified message: bombing Syria will create even more conflict, not resolution. At yet another protest in Union Square on Friday night, some protesters said they don't believe Syrian President Bashar al-Assad was behind the chemical attacks earlier this week and that U.S. intervention will only make things worse. "It's only going to escalate the violence," Martin Jennings said. "I'm really concerned about the future of the Syrian people." Another protester, Greg Butterfield, said that the U.S. should stay out of the country. "Get out of Syria, stop interfering, and let the people of Syria decide for themselves," Butterfield said. Syrian officials said at least seven people were killed, including several children, after the United States launched 59 Tomahawk cruise missiles at a Syrian airfield in response to a gas attacked unleashed in Idlib on Tuesday. Thursday's attack was the first direct American assault on the Syrian government and Trump's most dramatic military order since assuming the presidency just over two months ago. The United States U.N. Ambassador Nikki Haley called the move a "very measured step" and said the country is prepared to "do more" in remarks at the U.N. Security Council Friday. "The United States took a very measured step last night," she said. "We are prepared to do more, but we hope that will not be necessary."